These three ants generate, by far, the most trouble and the most phone calls of any other ants we deal with here in East Texas. We've pictured them along with some particular details to help you discern the differences. 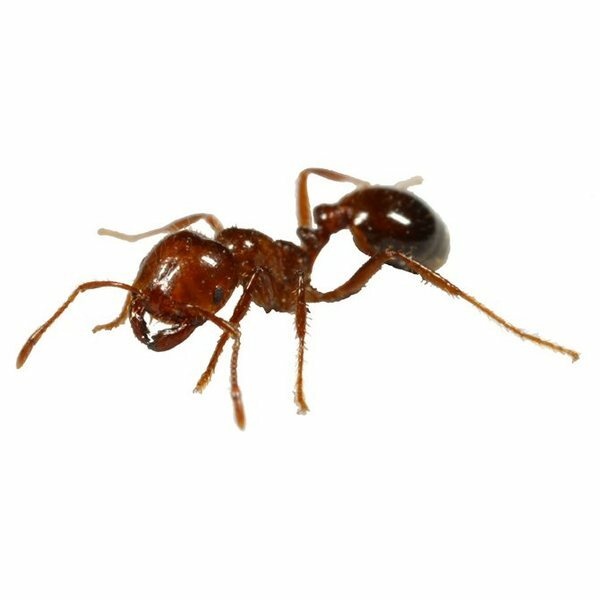 We like to refer to this ant as a "carpenter ant wanna be" because they tend to produce alot of ant frass (debris) that causes homeowners to believe they have a carpenter ant problem. This ant doesn't chew any wood but it does prefer nesting inside a home as opposed to remaining outdoors in the wild. Other than their smaller size, as compared to any carpenter ant, their abdomen is "heart-shaped" when viewed from directly above (pic on right). Acrobat ants get their name from their habit of holding their abdomen above their thorax whenever the workers or colony are disturbed (pic on left). Acrobat ants DO HAVE STINGERS and will sting if provoked! Contrary to what people often believe, Carpenter ants DO NOT EAT WOOD. They simply chew it away in order to make room for a growing colony. The debris, called frass, is often the first sign of Carpenter ant activity. Carpenter ants are a structure-infesting ant that will inhabit trees or houses or other structures. They are very destructive to trees in that they often chew "across" the wood grain as opposed to chewing "with" the grain, as termites do. This in turn severs the sap lines that run vertical to the tree causing first the limbs to die off, i.e., sort of like a tree having a stroke. In Texas, we have two species of Carpenter ants: a red & black (pictured left) and a much larger solid black species (right pic). The middle pic demonstrates Carpenter ants taking an interest in the honeydew generated from the aphids present on a tree limb. This is a favorite sweet meal of any ant. 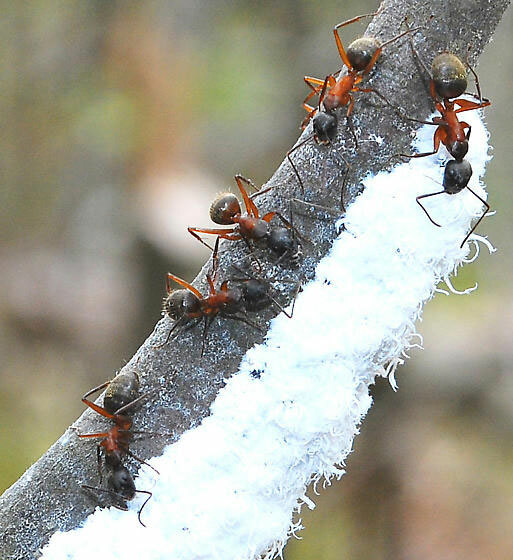 Fire ants populate the southern United States and have been a scourge of landowners, farmers, and homeowners for decades. Their characteristic large earthen mounds are highly visible after large rains, however, they may not build mounds at all during times of insufficient rainfall. 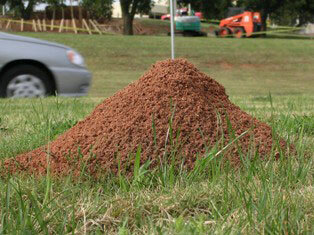 The mound is designed to get the colonies eggs and larvae out of the soggy or saturated soil and aerate the colony. They often use something strong and extending vertical to help support their mounds, such as fence posts, clumps of tall grass such as Johnson Grass, or landscape materials or plants. When these aren't available, they use concrete walkways, house slabs, parking curbs, or other man-made items, to build their mound beneath and use as a sort of protection. They'll only be visible then by using some of the soil to use as entry/exit into the mound (see pics below). Fire ants DO HAVE stingers and contrary to everyone saying they were "bitten" by fire ants, it's not the biting end that's the problem. They will simply use their mandibles to hold on while their abdomen presses their stinger into you repeatedly, over and over. 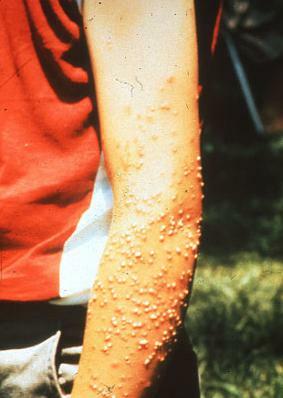 The last pic below is an example of someone's arm that was stung by a colony. There are several other species of ants that, to the naked eye, look like Fire ants. 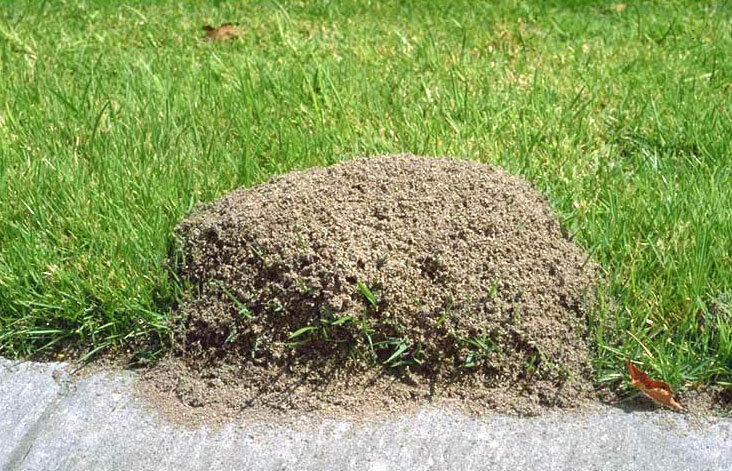 However, one simple trick to quickly identify if you really have fire ants or not: lightly kick the mound so as to excite the ant colony. 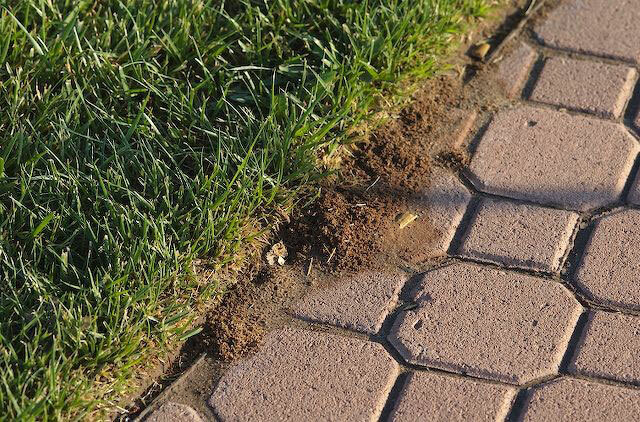 If they come swarming out of there like an explosion of ants, then you definitely have a Fire ant colony. 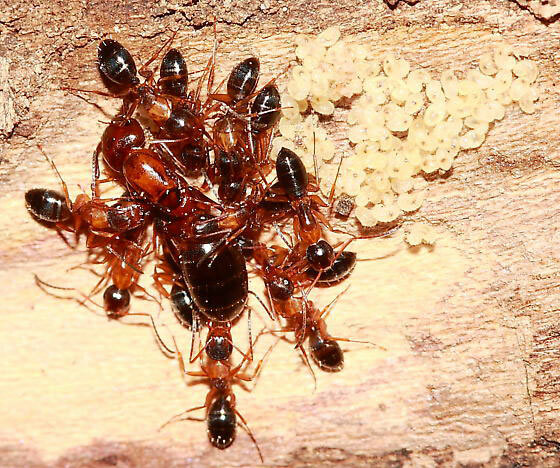 No other ant species will explode out of their colony the way Fire ants do. THIS is what makes them so dangerous because by the time you realize you've stepped onto a colony, they have swarmed all over your feet and legs.